Finger-pointing rampant in aftermath of Arizona shooting | can i just finish my waffle? Finger-pointing began a few hours after this shooting. It is important to note that all the fingers and all the accusing mouths were on the left side of the equation. This post is in RESPONSE to all that blame that has come from the left in less than two days, the rampant hypocrisy from the self-righteous progressive left wing that has taken over the democrat party. Gabrielle Giffords was a democrat, but she was a “blue dog” democrat and they are hated just about as bad as republicans by those in power in that party. Almost from the moment of this Arizona shooting, the left wing in the country, and this includes the left wing media – or maybe especially the left wing media – have been trying to somehow blame the right, talk radio, Fox News, Sarah Palin, for this tragedy. First of all, it infuriates me. One person shot and killed and wounded these people and we’re talking about people who were not there and have not one thing to do with this. But even more, they can’t seem to see or don’t want to see, it is really their side who is violent, who constantly uses hate speech to those who do not agree with them, and their reaction to this shooting is a perfect example of that. In trying to blame the right, they have made this all about politics and as a opportunity to use it for political advantage. Anybody who has been on the internet for any length of time has long known the hate language comes without restraint from, yes, Obama people. Now they want to project their own constant use of “vitriolic” speech onto others. They could not wait! They did not wait, not even until the shooter had been named, not for any of the facts to come out. Of course, as it turns out the shooter is a leftist probably fueled by the rhetoric of the hateful left wing. The first I heard was Linda Lopez who came on with Shep Smith naming the tea party as the culprit and I remember she specifically said the shooter was an “Afghan vet.” Of course, he was not a veteran of any kind. Oh, but they want him to be a veteran so it will fit within some profile that Janet Napolitano and whats his name Potok, Mark Potok, has put together as those to watch for. Shep Smith did not stop her nor challenge her either. I can’t remember just how far into the story this was, but if you can pinpoint when the name of the shooter came out, you can know it was before that. The MSM has carried this narrative all weekend. This did not happen until sometime late Saturday morning. I am rambling, but I can’t help it. This has to be said ramble or not. If anything EVER happens, God forbid, to Sarah Palin, Rush Limbaugh, Glenn Beck or any other of the targets of their “vitriol” it will be easy to point to many, many, many statements of suggested violence and death that the left has wished on them and to make them responsible. I keep saying vitriol because that was the word the sheriff of Pima County kept using during his minutes before the camera as he proceeded to blame talk radio, et cetera, for the shooting. This is a law enforcement person, sheriff of a county, and you would think he was a paid Obama mouth piece. I’m going to put up just a few examples of violence hoped for and the two I have in mind right now were said on MSNBC, that’s national tv, one by Chris Matthews, the other by Mark Penn (Obama advisor). I’m sure there are countless examples coming from Keith Olbermann but none come to mind right now. So the hypocritical and sanctimonious LECTURING coming from the left trying to say that ALL (oh, and Gene Robinson – again on MSNBC) uncivil and problematic language comes from the right. Yeah, Robinson said so in plain words. I’ll put up his video, too. I am recalling something that was written by Paul Krugman, NYT, but I haven’t read that. But the examples of finger pointing and the blame game that has been engaged in by the democrat/progressive/leftist public broadcasting outlets is countless. And it’s only Monday morning. We’re not even talking about the web sites such as Daily Kos, but from MAINSTREAM television and print outlets. The only thing that is anything other than speculation and wishful thinking that has been mentioned is the map that Sarah Palin had published using gun sights – I don’t know, not a gun person – and saying something like “reload.” This is the only evidence that has been produced and I dare say that is because there is no evidence of violence or threats coming from the mainstream conservative ranks. Well, Daily Kos has already REMOVED from their website references to Ms. Giffords (along with other democrats they opposed) in bulls eye to be defeated. Now, I know they are only talking about working to have them defeated. But, hey, if we’re going to talk about language that is used frequently in the political realm, then they have to be held to the same scrutiny. 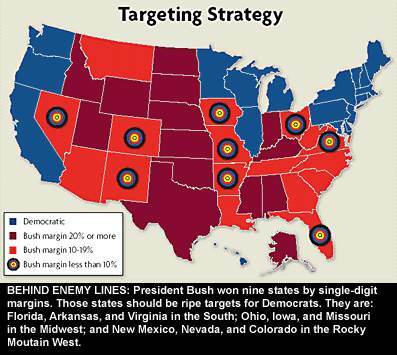 The democrats have used this method of expression – marking opponents, et cetera – and I’ll post examples of that below. But, now, to start with, we have a president who promised to bring America together and promote unity. Here’s just a few statements he has made that uses language of combat or violence. Oh, and by the way he is a democrat, far left one at that. So we don’t have much leadership. He also very recently has said if the republicans win in the November election, there will be “hand to hand combat.” And he has recently referred to republicans as “holding hostage” or “hostage takers” when referring to their opposition to some legislation. Harry Reid called the tea party evil=mongers and Nancy Pelosi said the tea party was made up of a mob and Nazis. At the time, these were the three top leaders of our country. Democrats . Right, democrats. So, come on, the English language is full of words that can be used in different ways. Just this morning I came across three of them. My computer came up with a choice, copy, paste, delete, or RELOAD. I was also thinking of using some BULLET points and TARGETING certain examples I had in mind. So to attribute some nefarious meaning to every word without taking into consideration what is really meant by it is dishonest and really pretty silly in my estimation. So what are we going to do, eliminate words? I don’t think so. Any attempt to do that is going to make me use the word more. I wouldn’t even be talking about this except in defense. I’m not in favor of the word police. Here are my examples of the MSM using violent language. Both of these just happen to be MSNBC. But it is just a well known fact that MSNBC is the face of the liberal democrat progressive in this country. No denying that. And below, Chris Matthews says something about putting a pellet in Rush Limbaugh’s mouth and watching his head explode. Now, I ask you, just assuming for the sake of argument the Arizona shooter was influenced by something he heard, knowing what we now know about the left leanings of Jared Loughner, would he be more likely to watch MSNBC or listen to Rush Limbaugh? But, of course, I heard a report last night that, after thoroughly searching his house, his computer, his writings, there was found not one mention of talk radio, the tea party, Sarah Palin, or anything that would connect him to them. I am adding the image below of a post that appeared on the Daily Kos two days before the shooting. 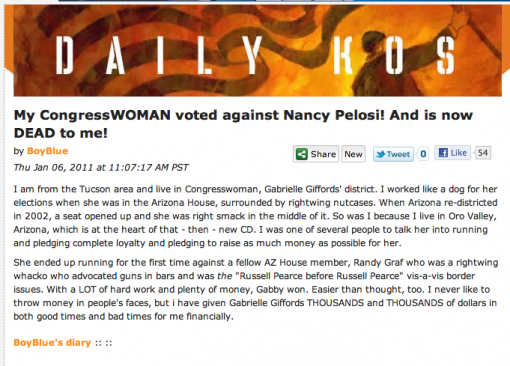 The most important fact about this particular post is that it is not random – his congresswoman was Gabrielle Giffords. He talks about her being dead to him because of a Vote she made and two days later she is shot in the head. I can tell you this actually was there because I saw it, but within hours, maybe minutes of the shooting, Daily Kos removed it. Now, if a suspect to a crime tries to destroy evidence or flees it is considered evidence of guilt. The reason we have a copy of this is because it was captured by Hillbuzz just in time. Michele Malkin has a great compilation of examples on this topic. Oh, and by the way, I want to mark this down for the record – this gunman was NOT clinging to the Bible. He was a raving atheist with some kind of voodoo shrine in his back yard. Bella, you might want to add Michelle Malkin’s link on this topic. I went through her retrospective, and commented, she forgot to mention when Sarah Palin’s church was burned down – the investigation stated it was arson. Thanks, Ree, I added her link. Whew! blood, sweat, and tears on this one. He planned this a long long time ago before the TEA party and Sarah Palin. But if the Left really wants to have a discussion about being careful and inciting people to violence. We need to rehash 2006 Death of a President.” An Assassination Fantasy Film” You know art/ SNARK. This movie was made when George W Bush was a sitting President. The film makers believed their 1st Amendment Rights gave them every right – their Freedom of Expression. You know Free Speech for me but not for thee…I have seen that movie too. When you get right down to the heart of the matter, the progressive left does not believe in the rights of the constitution – only their own rights. It is being played out every day that they take what they want and only use the constitution to work their will. Basically, they believe in a dictatorship or ruling class. They will rule because they know best about everything. And as that sheriff said, “one party is just standing in the way of what the other party wants to do for America.” Right. That pretty much sums it up. And they do not believe there are any limits to their power to work their will. That ain’t America. Actually, I think Loughner probably couldn’t find a job in Obama’s America. That’s probably what he was mad about.